Scrape out vanilla bean. Add rhubarb, sugar, vanilla bean seeds, scraped out vanilla bean, lemon juice and water to a saucepan and simmer, covered with a lid, for approx. 12 – 15 min. on medium-low heat, or until rhubarb is softened. Pass mixture through a sieve, passing the clear juice into a mixing bowl. Press rhubarb mixture carefully in order to extract all juices. Let cool. Pour rhubarb juice and pink grapefruit juice into a serving glass. Fill with ice. Add dry sparkling rosé. 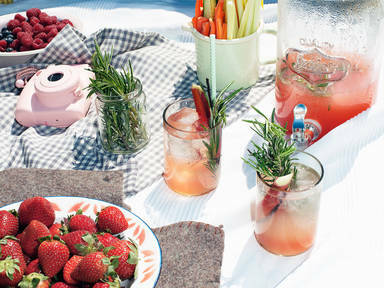 Garnish with rosemary, rhubarb, and vanilla bean.